In April 2018, Deb joined the Rapid City Commercial team partnering with her husband Brad to provide administrative and business development support. 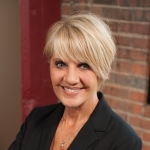 Her experience managing, buying and selling real estate with Brad over the years is an invaluable asset to the team. A native of Deadwood, South Dakota and graduate of Lead High School, Deb worked in the legal field as a legal secretary for 27 years. She was the administrative assistant for the President of a private law firm in Rapid City for 21 years. Prior to that she worked for three attorneys in private practice in Deadwood. Deb is very active in the community, volunteering for the Black Hills Stock Show and Rodeo, local food drives, and other charities throughout the year. In their spare time, she and Brad love to go mountain biking.